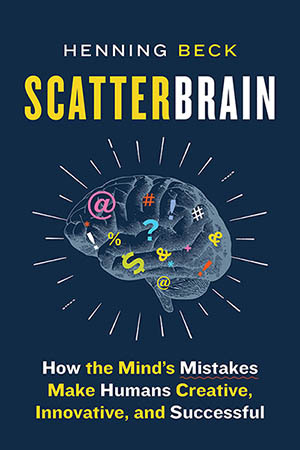 I’ve been publishing popular science books about the brain since 2012. Because neuroscience has so many impacts on us, I try to give insights into latest research and it’s relevance to our daily life. How we get to new ideas, what myths and legends about the brain are floeating around (and which of them are actually true), and why the brain is everything but perfect. I always give some counter-intuitive perspective and show the brain as never seen before. Always based on current research – but with an entertaining twist. Many people think that it is most important to work harder, faster and more efficient to perform. But this is exactly what machines can do as well. That’s why every efficient procedure will be replaced by algorithms, eventually. However, something cannot be replaced: inefficient thinking – and that is what your brain is expert in. We are distracted, inaccurate and oblivious all the time. But these weaknesses hide our true mental power: We understand the world, develop new ideas or take good decisions. In this book I show why it is the mistake in our thinking, not the perfection, that separates us from uncreative machines and gives us the ultimate cognitive edge we should appreciate and make use of.